​​​Here you will find a list and description of all of our current Special Interest (Kids, Naptime, and Serger) classes. Scroll down to see all the options and when you see the one you want to take follow the Book Now link to be taken to our Booking site to reserve your spot. The following prerequisites and Class policies apply to all Special Interest Classes. Please familiarize yourself with them. Please refer to each class below for a list of supplies. We keep our kids classes small. This ensures that each child gets all the help and attention they need. Please make sure that your child understands that this is a class that will require their attention and maturity. We will be using tools that can hurt ourselves and our friends if we aren't careful. No sewing experience required for the Kids Can Sew classes. For the Kids Can Sew 2.0 classes, kids should have taken several classes with us already, or be confident and proficient with threading a sewing machine, sewing in a straight line, and cutting fabric. All fabric and supplies can be purchased in store or provided by yourself. It is recommended that all fabric is washed prior to the course date. Minimum registration is 3 students. Maximum is 5 students. Non-mobile babies are welcome to attend with their parent. All fabric and supplies can be purchased in store or provided by yourself. It is recommended that all fabric be wash prior to the class date. Minimum registration is 3 students. Maximum is 5. Minimum registration is 3 students. Maximum is 4. Space in our classes is limited, therefore in order to reserve your seat, a 100% non-refundable deposit is required. You may register for a class in person, online, or over the phone (613-854-9091) with a credit card. Please refer to our Class Policies for more information before scheduling a class. Paddye Mann is a renowned Canadian fashion designer. She is the winner of numerous design awards, including the Clairol Award for Top Canadian Designer. Working from her studio in Pakenham with a dedicated team of talented artisans, Paddye has spent the last three decades dressing women from Canada and around the world. She has a unique philosophy about why we dress the way we do, and why it’s important to understand the choices we make about what we make and wear. Paddye is a Fellow of the Royal Canadian Academy of the Arts. Her work can be found at her studio boutique in Pakenham ON, and at the Fogo Island Inn, Newfoundland. Long-standing contributing author to Threads Magazine, her advice is trusted by home sewists the world over. Fabrications is thrilled to be partnering with Paddye for a series of creative adventures given at our location on Wednesday evenings from 6-8:30pm. Registration fee is $15/pp and may be used as a credit for same day purchase in store. Registration is limited to 15 people. April 24th: Dress the Shape you Have – After three decades of dressing women of all ages and shapes, Paddye has an eye for which shapes make each woman feel really great in her clothes. Join us as she gives us insight into which of our patterns we should consider for our particular shape and lifestyle. May 8th: Measure Twice, Cut Once! – This advice applies to sewing as well as carpentry. But what should we measure? Join us as Paddye shows us where and how to measure for a perfect fit. As always, if you have questions, or problem projects, bring them with you. June 5th: It Doesn’t Fit! - The crotch is uncomfortable? The sleeves dig into your underarms? There’s weird stretch lines? Bring in your problem project and Paddye’ll help you fix it. Bring a notebook too, Paddye’s classes are a goldmine of information! June 19th: Build a travel wardrobe - Want to travel light, yet still look and feel fabulous in all situations? Join us as Paddye talks about creating a travel wardrobe that's perfect for you and your trip. September 4th: What can I do with Canvas? – Canvas is an extremely versatile fabric, and is often an overlooked yet affordable fabric option for lots of projects. Join us as Paddye gives us examples of different canvas projects. September 25th : Playing with Skirts - Skirts are often an overlooked wardrobe staple. Learn about playing with circles and semi-circles and bring skirts out of the office and into everyday. As always, if you have questions, or problem projects, bring them with you. Patricia Belyea, a self proclaimed Japanophile, imports vintage yukata cottons. Patricia is the owner of Okan Arts, a design studio and micro quilt shop, in her home in Seattle, Washington. She focuses on making innovative quilts, speaking and teaching workshops on her innovative quilting techniques. Meet Patricia and learn about the genesis of her book, East-Meets-West Quilts. Over the three years that Patricia made quilts for the project, some never made it into the book. Patricia will have three of those on hand and explain why they were rejected—including the ugliest quilt she has ever made. She will also bring three pieces of yukata cotton as door prizes. Fabrications is thrilled to welcome Patricia - and her quilts! - to our location on Wednesday May 22nd from 7 to 9pm. Registration fee is $15/pp and may be used as a credit for same day purchase in store. Registration is limited to 12 people. If you already have Patricia’s book, be sure to bring it so she can sign your copy. We will have copies in store for purchase. Zhawenim Designs is a local Native arts and crafts business run by Ashley-Rose Machendagoos. Indigenous bead work is their specialty! They offer a variety of workshops throughout the Ottawa region. At Zhawenim Designs, it is believed that “Beading Is Medicine.” Their intention is to share this traditional art form in a contemporary context, so that this powerful medicine can bring happiness and prosperity to all! Join Zhawenim Designs for an introductory course on bead weaving! In this course, Ashley-Rose Machendagoos will guide each participant step-by-step, teaching them the basic process of bead weaving. Each participant will receive all of the materials required to make their very own bead loom bracelet. See you there! Wiingezin, miigwech! 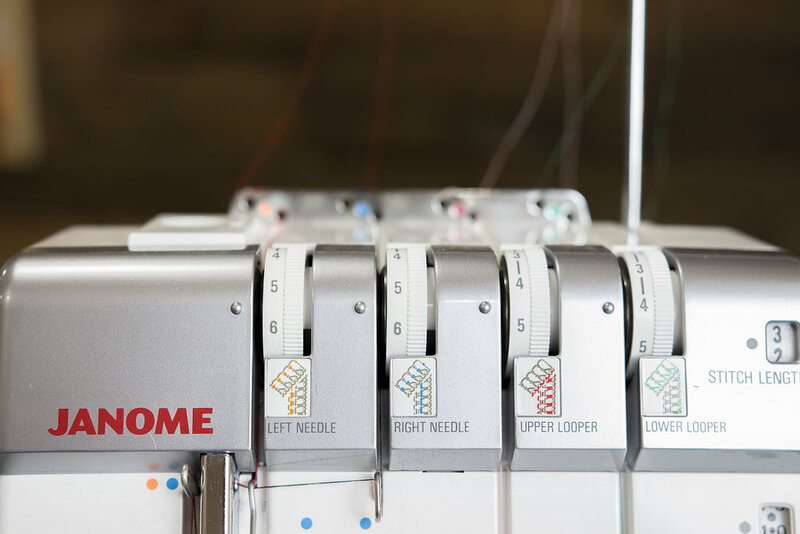 ​Do you have a love hate relationship with your serger? Are you too afraid to use it? Maybe you just can’t figure out how to get started. Do you want to rent the store serger to use outside of class hours? The purpose of 3 or 4 threads and how to convert to a rolled hem. How to sew inside and outside curves. How to make gathers with the differential feed. The class fee includes a Sewing Club card which entitles the holder to 10 prepaid hours in our sewing studio (a $65 dollar value). At the end of the class, students will be given a 'Serger Certified' card that entitles them to use the store sergers during studio rental time. THE fashion accessory for all of the most fabulous doggies in your life. Make one to match each of YOUR outfits!! 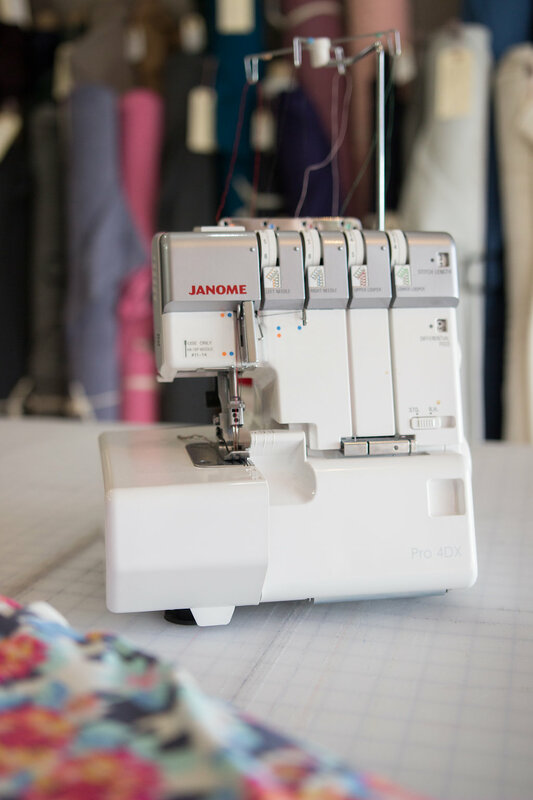 This easy beginner class will teach you the basics of operating a sewing machine, sewing in a straight line, pivoting corners, and turning items right side out. We'll have time in the this class to make two bandanas, so pick out a couple fun fabrics!! ​two fat quarters of quilting cotton in a variety of colours and prints. Learn how to sew with knit fabrics, and start on your journey of making your own clothing. This pattern is a great basic shirt for all sorts of kids and can easily be lengthened into a tunic or dress. Pattern is included with class registration. Learn how to make an envelope style pillow cover, with a fun twist. This class will introduce kids to how to operate a sewing machine. The pocket at the front of the pillow is a great spot to store you favourite book or stuffie!